A new threat has been detected and the Capitol has released the hounds! The Capitol will use any and every weapon in its arsenal to destroy the Resistance, and so when war broke out, they did not hesitate to put their genetically altered ‘mutts’ into the field. Mutts are dangerous abominations that sow terror whenever they are deployed. Even their peacekeeper handlers are wary when dealing with them. In The Hunger Games: Mockingjay – The Board Game, mutts are a powerful but rare unit. A full strike team of 6 mutts is a strong weapon as they resolve combat on a D12, the highest die in the game. Today we have also released a copy of the rulebook so you can get a closer look at the various units that you as a player will have at your command including the mutts and hovercrafts. 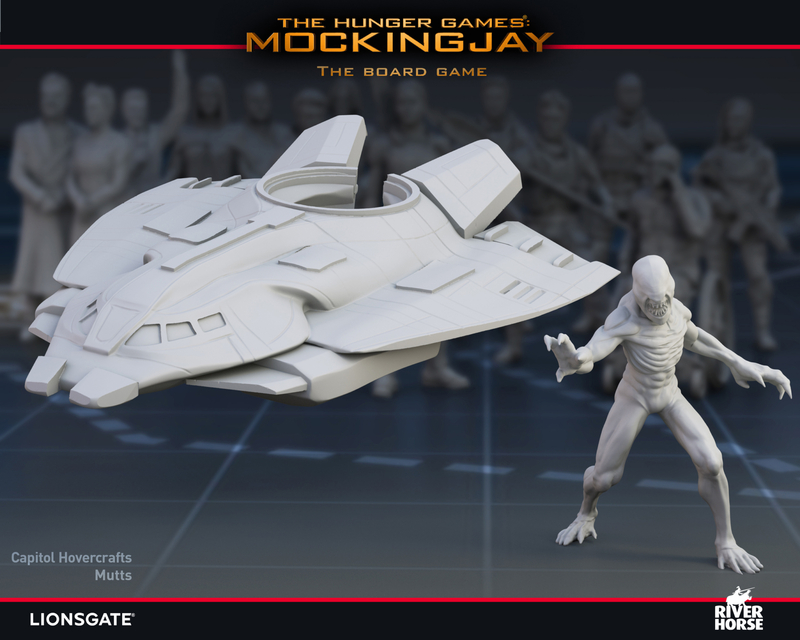 In the game, both the Capitol and Resistance have access to a small number of hovercrafts. These hovercraft are vital to the maneuverability and strike capability of your force. Whenever a hovercraft moves, they can move with a friendly unit. This and the fact that hovercrafts get a special move phase to themselves, means that you can use them to transport your units efficiently to where they are most effective. Not only are they fast-moving, but hovercrafts also conduct combat with the purple D10 die, giving them a higher chance of rolling a five or higher, and thus capture enemy units. Thank you all for your ongoing support, and we look forward to sharing more details of The Hunger Games: Mockingjay – The Board Game soon!